Arguments over gentrification are almost always starker than the thing itself. That new coffee place on the corner? It’s a state-sponsored hate crime, wiping out history and clearing out poor people, just to gratify developers and their undeserving, overpaying clientele. Or else it’s a welcome sign of brightness where for decades residents have done without a basic pleasure of urban life and have had few incentives just to walk down the street. In real life, you get the GrandLo Café, a suspiciously bright, generically appealing coffee den on Broome Street that takes no cash, only cards, and serves concoctions whose names were never heard on the Lower East Side in my great-grandmother’s day: latte, avocado toast—salad, even! You would never know that it’s a non-profit operation run by the century-old Grand St. Settlement, or that, under cover of caffeine, it’s really a job-training center for at-risk youth. The Lower East Side contains a storehouse of vanished memories: Streit’s matzoh factory, the synagogue on Norfolk Street, a slew of schmatte emporia, the street gang Satan’s Sinners Nomads, a whole canto in the tale of Puerto Rico. Diasporas recongregated in these jammed blocks, then gratefully scattered again, so that a vast web of family and lore extends from here to the Pacific Ocean and beyond. New construction always feels like an erasure of sorts, and Essex Crossing is big enough to wipe out a whole library’s worth of forgotten tales. But that deletion began with the urban pillaging known as slum clearance in the late 1950s, leaving a hole that the new development begins to heal. Half a century ago, the city razed thousands of tenements and designated the Seward Park Urban Renewal Area (SPURA), turning a once-jammed swath along Delancey Street into 20-acre wasteland. Sheldon Silver, the felonious speaker of the state assembly, managed to block construction for decades, trying to preserve his ebbing Jewish constituency, and the vacant lots stayed vacant. Finally, life is flowing back in. 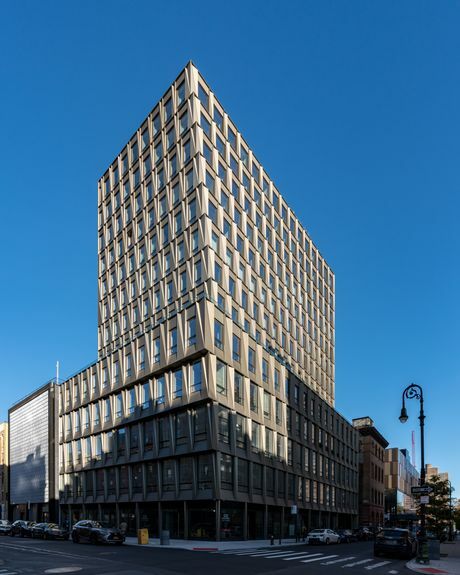 GrandLo Cafe is just one small piece of the mammoth Essex Crossing, a $1.5-billion, multi-building megaproject launched during the Bloomberg era, master-planned by SHoP Architects, developed by Delancey Street Associates, and designed by a fistful of different firms. It’s been a long time coming. Brought to you by the same administration that produced Hudson Yards, this revamped neighborhood bears many of the markers of standard-issue bourgeoisification: a designer pocket park, Target, Trader Joe’s, boxy towers with metal facades and furnished roof gardens, a 14-screen multiplex equipped with the kind of push-button deck chairs that swallow you up and put you to sleep until the final credits. Yet the new development also represents a progressive victory. Half its 1,079 apartments are affordable for residents, many of them seniors, with a range of incomes that begins at $15,000 for a family of two and rises to nearly ten times that much for a family of three. It’s ironic that for years the words “affordable housing” were anathema to many Lower East Siders, who envisioned more glum brick towers and needle-strewn playgrounds. Instead, low- to middle-income residents inhabit the same buildings as the hyper-affluent, whose high rents subsidize their neighbors’ bargains. Just as important to the area’s future feel is the new home of the city-run Essex Street Market, which SHoP inserted into a rental building designed by Handel Architects. Vendors who occupy the dingy remnants of what was once a four-building cinderblock shed will shortly move across the street into a vibrant, sunny space. Hugh Boyd, an architect who specializes in market halls, tailored stalls to the tenants’ needs: a moss-green shelving system for an herbal apothecary, a counter with custom barstools for the legendary brunch at Shopsin’s, a stainless-steel command post for a butcher. The street-level market will spill downstairs into the privately managed Market Line, a global festival of pierogi, bratwurst, tacos, and phō. (Eventually, three high-ceilinged basement halls will be linked by tunnels beneath Norfolk and Suffolk Streets.) Above, a grid of black steel columns, generous clerestory windows, and a light-filled vault recall the cast-iron tracery of markets from a century ago, like Paris’ long-demolished Les Halles and Mercado de la Victoria in Puebla, Mexico, or contemporary reinterpretations like Barcelona’s Mercat de Santa Caterina. 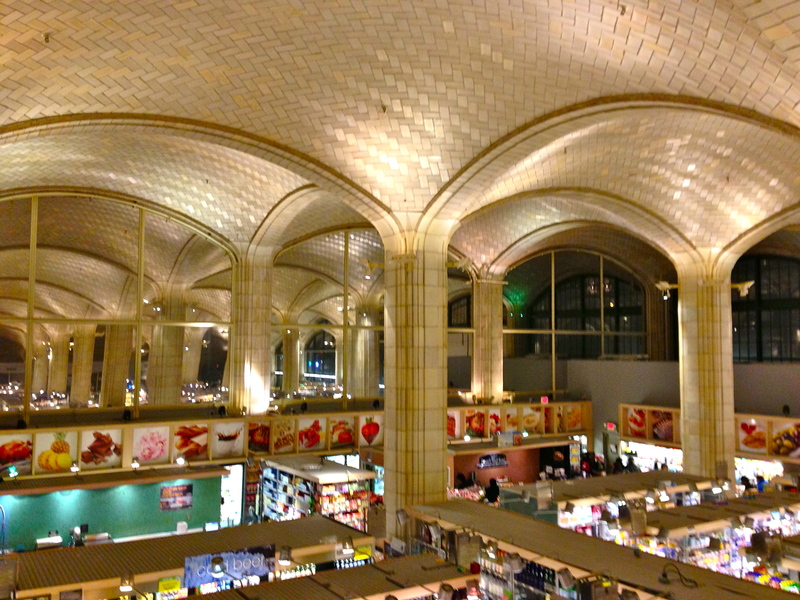 On the sloping white ceiling, a rhythm of ribs, ripples, and scoops diffuses light and sound like a contemporary version of a Guastavino vault. These comparisons don’t flatter the new facility, which is neither as grand nor as gorgeous as the models it invokes, but the gestures will help keep the market’s personality from sluicing away. Essex Crossing both transforms and fits into the architectural salmagundi of the Lower East Side. 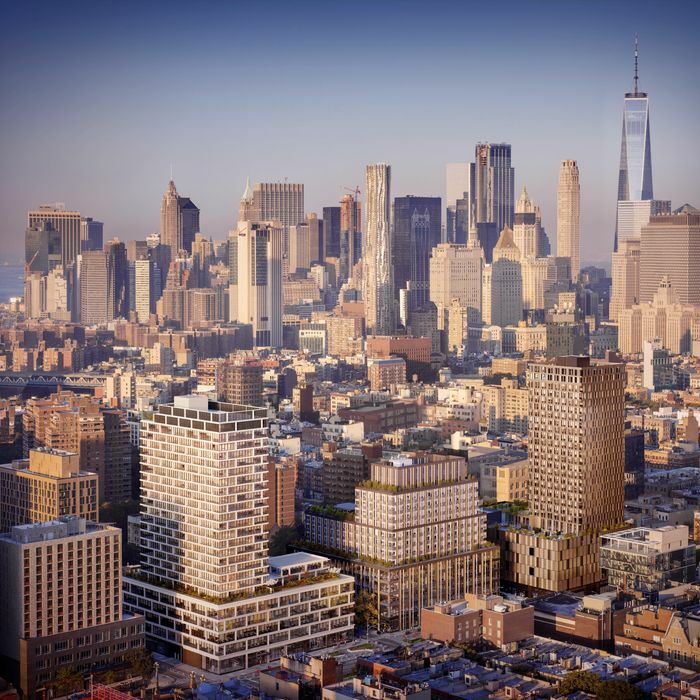 Tenements, squat shops, bulky housing projects, Bernard Tchumi’s blue-glazed tuber, tall glass slabs, and designer condos all jostle together, so interloping designers can respond to whatever scraps of context they choose. Murals and graffiti, for example, will get some designated and highly visible walls, turning street art into a real estate amenity. A handsome commercial palazzo from the 1890s holds the corner of Essex and Broome Streets, defying the new development to overwhelm it. SHoP bracketed it with a brace of buildings, both perfectly fine without being fussily refined. On one side, an apartment tower clad in faceted grey-gold aluminum panels provides a play of glimmer and shadow. On the other, the International Center for Photography, for now still entombed in a glum basement on Bowery, will soon move into a more promising four-story black-bordered box that punches through the block. In a development largely without Instagrammable architecture, it’s the unlikely Rubik’s cube of uses that gives cause for thanks. Instead of treating the area as a blank slate for a developer’s dream, planners stitched together institutions, homes, entertainment, offices, non-deluxe shopping, cheap food, sidewalks, wide avenues, and narrow streets. The result is neither a new high-gloss enclave nor a bastion of 1970s anarchy, but a place that’s just messy, dense, and motley enough to feel like New York again.